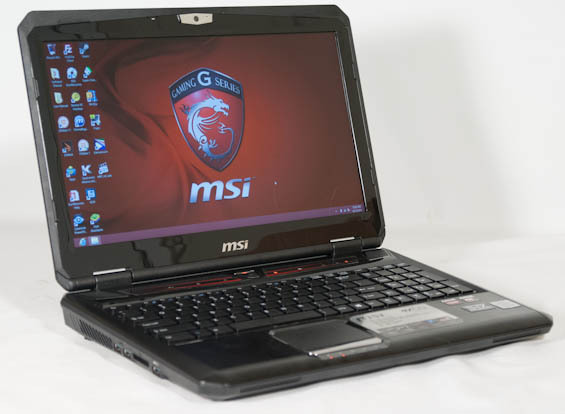 Gaming notebooks are increasing in popularity, but getting affordable gaming hardware can still be a challenging task. While midrange parts like NVIDIA's GeForce GT 740M and 750M or AMD's Radeon HD 8600M line aren't bad options and will definitely do the job in a pinch, having a good gaming experience generally requires more muscle. Whether you want to boost minimum framerates for smoother play or just turn on all the bells and whistles, a strong GPU is critical. Unfortunately, a strong GPU also costs money. 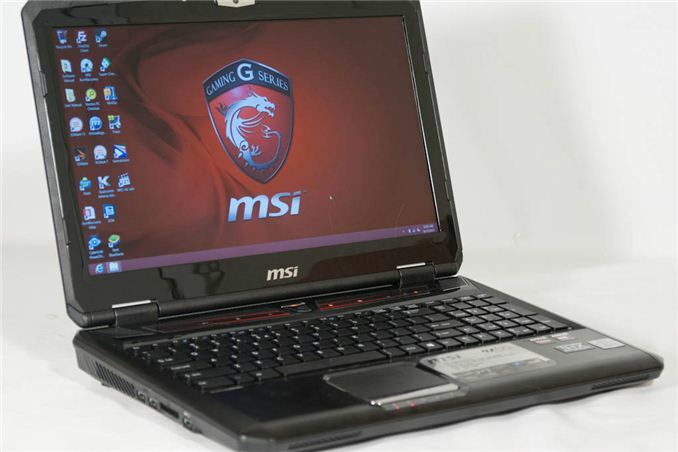 MSI introduced its first-generation GX60 gaming notebook some time towards the end of last year as a way to bridge the gap. If you were willing to take a hit in CPU performance by using a Trinity-based AMD A10-4600M, you could be served by a very powerful AMD Radeon HD 7970M on the graphics side. Budget gamers on the desktop will often cut CPU budget if it means getting a faster graphics card, and that's the principle MSI is operating off of. The fly in the ointment is that the gaming landscape has changed substantially since the first GX60. Games like Far Cry 3, Crysis 3, and Tomb Raider are all true next generation titles, requiring a healthy amount of CPU horsepower along with their substantial graphics requirements. As we saw in the first part of our review of the AMD A10-5750M, AMD has made some headway in CPU performance compared to last generation's Trinity chips, but we're still dealing with fundamentally the same silicon. Dimensions 14.97" x 10.24" x 1.77"
As far as mobile AMD chips go, the A10-5750M is about as fast as it gets. Trinity and Richland did away with the 45W parts you could find in the Llano generation, so we're essentially hoping that the pair of Piledriver modules running at a 2.5GHz nominal clock speed can pick up enough slack to power the AMD Radeon HD 7970M. That Radeon HD 7970M is essentially the MSI GX60's reason for being. MSI went all-in on the graphics side, and an updated model of the GX60 is due soon that bumps the 7970M to an 8970M. The 7970M is based on AMD's Pitcairn desktop chip: it features 1,280 of AMD's GCN cores running at a healthy 850MHz clock rate, along with 80 texture units and 32 raster operators. Our review unit features 2GB of GDDR5 on a 256-bit memory bus running at 4.8GHz. If you're concerned our test results with the 7970M are going to be outdated when the 8970M-enabled GX60 lands, fear not: the only difference is a 50MHz boost clock on the 8970M. The chip is otherwise identical. Performance-wise, the 7970M and 8970M should stack up somewhere between the desktop HD 7850 and 7870, leaning more towards the 7870. Where I'm a bit frustrated with the MSI GX60 is in both the memory configuration and the storage configuration. All told this is basically a smaller version of the GT70 chassis, less the backlit keyboard, but MSI opted to only include one DIMM instead of two for the memory, and we're stuck with a mechanical hard disk for storage duties. Thankfully you can get the GX60 for $1,199, which is a pretty good deal for a system with such a powerful GPU at its heart, and that does take some of the edge off. Since the first part of the Richland review focused on the AMD A10-A5750M with dual-channel memory enabled, we have an opportunity now to compare those CPU results to the stock results of the GX60, which runs in only single-channel mode. As I understand, video data form discrete GPU is transferred over PCIe to internal video buffer of APU, eating some memory bandwidth. Not only are they only using a single channel, they're using DDR3-1600. The 5750M is unique in AMD's mobile lineup in that it supports DDR3-1866 out of the box - none of the Trinity mobile chips (or lesser Richland models) can claim this. Now granted, when relying on the discrete graphics this isn't going to make as big of a difference. But there will be some improvement running dual channel 1866. I also have to wonder if Enduro is causing issues as well. actually that depends where you buy it from. The one i bought has 2x4GB besides that i must say while alot of people are bashing this pc, i love it. Design of the case, ease of access to all parts, heat management are best i have ever seen in any laptop. Performance is bottlenecked by the cpu ofc but not as much as everyone are saying. My friend bought i5+nvidia 7xx series card, not sure which exactly and performance in most games is very similar, while he paid 150€ more for his. I did read the article. I was baffled by the poor results and went back to the front to see if I missed something and I saw " 1x8GB A-Data DDR3-1600 ". Thats when it immediately realized a problem. If this laptop only has one slot for DDR3 then this design was hampered from the beginning and ready to limp to the starting lines. That's incorrect. The 7970M has 2 GB of GDDR5 on a 256-bit memory interface. So the single channel memory is dedicated to the CPU only, and shouldn't hurt the 7970M performance.